It's an oddball trio of films opening in wide release this weekend, and in at least two of the three, quite literally so. Whatever you might say about Tim Burton's films (and there is plenty to say about them), he certainly has a recognizable style. Filled with bright colors, dutch angles and using a giant cricket bat labelled “WHIMSY!," Burton has defined a particular aesthetic for over 30 years now (we are old). 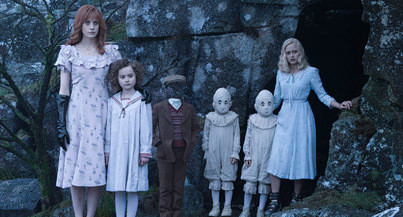 His latest, Miss Peregrine's Home For Peculiar Children, slides right into that realm of freaks and misfits. Based on the first of a series of YA novels, the movie is set in the early days of WWII, when a young boy starts having visions of terrible creatures. Stumbling upon some family lore, this leads him to a secluded school with a group of children with a variety of abilities, from controlling fire or air to people inhabiting animals, or can control time, or... you get the picture. It's basically a blend of Harry Potter and the X-Men, with Eva Green playing the Professor X/Dumbledore role, as the “peculiar” children use their powers to stave off disaster and protect the secrecy of their home. CGI-flavored action ensues (the boy who chews bees at you??!? ), but by most accounts, this is a bit of a return to form for Burton, who has stumbled in recent outings, even his successful ones. 2001's Planet of the Apes seems to be where it all started to go wrong, with a few blips of enjoyability (Big Fish, Sweeney Todd) in between, although Dark Shadows may be the nadir where his deadpan embrace of gothic aesthetic flopped like a fish. Some true magic might be back in the mix thanks to Burton largely following someone else's playbook for the story, and not too too overdoing it on the quirks. With a cast that includes Sam Jackson, Judi Dench, Terrence Stamp, Rupert Everett, Asa Butterfield (as audience surrogate) and Ella Purnell (2010ish for Christina Ricci), it's got a decent level of audience draw, and a solid look in commercials. With these adaptations, however, it's all about the popularity of the source material, which for this one is... moderate. Studios have gotten a little more hesitant about pulling out all their guns for these potential franchises since the Divergent disaster, even though that started well, and audiences have developed a more wary eye. I'd look for about $30 million here this weekend. True-life disaster returns to the big screen with Deepwater Horizon, the story of the 2010 explosion of the offshore oil rig in the Gulf of Mexico which caused the worst oil spill in US history. Directed by Peter Berg and starring Mark Wahlberg as one of the roughnecks on the rig, it goes much more into the escape from the burning wreckage than it does about what caused the explosion in the first place (okay, some brief background is there), making this a little bit of Titanic, minus the Celine Dion. Also starring Kurt Russell, John Malkovich, Kate Hudson and Ethan Suplee, it's a major adrenaline ride piggybacking off real life tragedy, so... slightly disconcerting? Mostly honoring of victims? Let's hope people see it that way, and reviews are quite positive about it for the nuts and bolts action part. The subject is a bit of a strange one, being so recent and one that hasn't been particularly mythologized for its loss of life, which makes me wonder what appetite there really is for it. However, the film does have the presence of Wahlberg, who excels in these type of intense, disaster related roles. While this one lacks the “hoo-rah” USAism of something like Lone Survivor, it appeals to a similar demographic and could be in for a strong weekend of around $25 million. Another victim of the Relativity bankruptcy, Masterminds finally makes its debut this weekend after a couple of years in post-production limbo. A heist comedy, it stars Zach Galifianakis as the night guard of an armored car company who organizes a bank robbery with the help of his misfit friends. They include Owen Wilson, Kristen Wiig, Kate McKinnon, Ken Marino and Mary Elizabeth Ellis, along with Jason Sudekis as a weirdo hitman, Leslie Jones and Jon Daly. All and all, it's a very funny group, though these sorts of comedy super-teams often create more in the way of theoretical comedy than actual comedy. If there were some super secret genius comedy film hiding in this, we'd probably see some evidence in the ads, but it appears to be a lot of obvious jokes punctuated by weird mannerisms. As a bit of an orphan film, it's also not quite getting the support it needs (Zach G also doesn't quite work as a lead), and will likely debut with about $8 million. Returning films are led by The Magnificent Seven, which started strong but faded within the weekend, earning $34 million. Word-of-mouth is underwhelming at best for this western remake, and I'd expect a drop to about $16 million. While facing a bit of competition from Peregrine, Storks should handle most of the young demographic this weekend, although its $21 million opening weekend must rank as a big disappointment for Warner Bros. I'd look for $13 million this frame. Finally, Sully should grab about $8 million this weekend as real life disasters (or near disasters) populate the multiplexes.